All photos by Ilan Ben Zion. Buenos Aires is a city with a split personality—a Latin American capital that’s convinced it’s a European metropolis. Its avenues are a frenetic mix of mock European and modernist styles, and its residents are descendants of immigrants from across the globe: Italians, Spaniards, Armenians, Irish, Arabs and Ashkenazic and Sephardic Jews. With its emergence in the mid-19th century, Argentina’s Jewish community was the first reincarnation of Castillian-speaking Jewry since the Spanish expulsion in 1492. Despite adversity and hardship, the Jews of Argentina have thrived. Argentina’s Jewish history is young by Jewish standards, even compared to other countries in the New World. The Argentinian government passed legislation to encourage European immigration in 1876. Be- tween 1869 and 1914, Argentina’s population exploded from 2 million to 7.8 million, among them over 100,000 Ashkenazic Jews. The first recorded Jewish wedding in Argentina was celebrated in 1860, when the community was only a few hundred strong. The German cargo ship The Weser arrived in Buenos Aires in August 1889 bearing the first boatload of 820 Jewish immigrants from the Ukraine, effectively doubling the country’s Jewish population. Pogroms in Russia, which precipitated the First Aliyah to Ottoman-controlled Palestine, spurred a parallel exodus to Argentina between 1881 and the turn of the century. Polish Jews followed after World War I, bringing a more urban outlook than their Russian counterparts. Like Baron de Rothschild with the First Aliyah, German Baron Mauricio de Hirsch envisioned and financed the Jewish colonization of the Argentinian plains. Jewish immigrants settled in farming communities in the outback and began growing crops and raising cattle. At the end of the 19th century, the vast majority of Jewish immigrants from Eastern Europe settled in colonies in the plains. By 1935, just 11 percent lived on farms, having moved to urban centers like Buenos Aires. Today, the country’s 250,000 Jews are roughly 20 percent Sephardic and the remainder Ashkenazic; they are overwhelmingly secular and liberal. The Conservative movement claims the most adherents as well as around 20 synagogues. The ultra-Orthodox community—including Chabad—was largely nonexistent until the past few decades, but is steadily growing. The major Jewish neighborhoods of Once, Palermo and Villa Crespo are filled with synagogues, Jewish schools and shops. A strong Zionist element emerged in the 1930s in response to fascist-inspired anti-Semitism in the Argentinian military and government. That Zionist ideology translated into the immigration of some Jews to the State of Israel in its early years, but several thousand made aliyah when the military dictatorship took over in 1976. Under the dictatorship, the junta “disappeared”—abducted and murdered—thousands of civilians suspected of affiliation or sympathy with leftist causes. Because of the historically liberal leanings of the Jewish community and anti-Semitism in the ranks of the military, Jews made up a disproportionate number of the political victims of the regime, an estimated 10 percent of the thousands murdered. Terrorism struck the community twice in the 1990s, first with the bombing of the Israeli Embassy on March 17, 1992, which left 29 dead. Two years later, on July 18, 1994, a car rigged with explosives pulled up to the AMIA Jewish community center. The detonation killed 85, injured hundreds and leveled the building. The investigation into Iran and Hezbollah’s involvement in the attack, and the Argentinian government’s alleged complicity, remains an open case and an open wound for Argentina and its Jewish community. Marshall Meyer, an American- born rabbi, moved to Argentina in 1959 to lead Congregación Israelita de la Republica Argentina (CIRA). During his prolific 26 years in Buenos Aires, Meyer founded the Seminario Rabinico Latinoamericano, the largest Conservative rabbinical school in Latin America, as well as the Comunidad Bet El synagogue, after leaving CIRA. Zionist ideology remains a core precept of Jewish identity in Argentina. During the economic and political crises of the late 1990s and early 2000s, more than 10,000 Jews made aliyah. 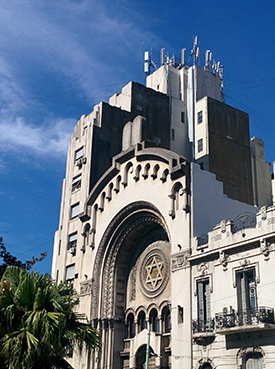 Dating to 1862, CIRA is the oldest Jewish congregation in Buenos Aires and resides in Templo Libertad downtown. 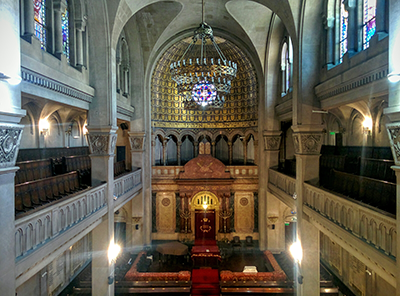 The building combines Romanesque and Byzantine styles with traditional Jewish motifs. It’s home not only to an active Conservative congregation, but to a modest museum of Jewish life in Argentina. For $10, visitors can look at the collection of Jewish manuscripts, the highlights of which are a miniature 19th-century Hebrew Bible from Poland and a 17th-century Dutch commentary on the Tanach with the signatures of its owners. The remainder of the museum is a jumble of Judaica explaining the cycle of Jewish life, an incongruous assortment of ancient pottery and a brief overview of Argentina’s Jewish history. Templo Libertad’s main sanctuary more closely resembles a European cathedral than the small houses of prayer that popped up on the Pampas when Jews first reached Argentina. The extravagantly decorated interior features ornate stone reliefs with Jewish motifs, dazzling stained-glass windows, a soaring ceiling and a gilt apse adorned with sheaves of wheat and the words of the Shema. One of CIRA’s spiritual leaders, Sergio Bergman, is the only rabbi serving in a government post outside of Israel. He is en-vironmental affairs minister in President Mauricio Macri’s Cabinet. Argentina’s generals, presidents and wealthy elites were laid to rest here in resplendent opulence. It’s an ostentatious marble necropolis embedded in the affluent neighborhood whose name it shares. While the cemetery is officially nondenominational, the entombed—most famously, former Argentine First Lady Eva Perón—are overwhelmingly Catholic. But a number of the mausoleums bear unmistakably Jewish symbols. 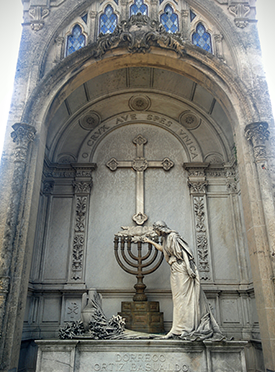 The tomb of Benjamín Breitman’s family had a bronze plaque bearing a Star of David affixed over the door when it was purchased, marking it as belonging to one of the few Jews interred in the cemetery. The Uribe y Lecea family tomb has two Stars of David carved into the stone, suggesting the mausoleum may have belonged to a Jewish family at some point. 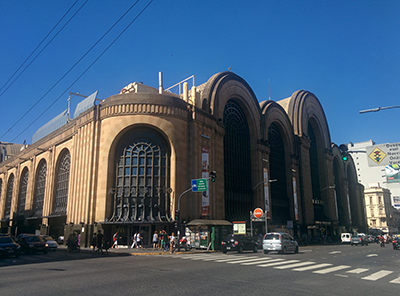 The Abasto shopping center on bustling Corrientes Avenue is a titanic temple to consumerism built by one of Argentina’s wealthiest developers, Eduardo Elsztain, an Orthodox Jew. Not only does it house some of the country’s trendiest shops, it also has the distinction of having the only kosher McDonald’s outside Israel. Just keep in mind that the kosher McDonald’s is on the third level— there’s a nonkosher one on the first floor. Abasto is a few blocks from the main artery of the Jewish community, Tucumán Street in Once. Within a block from the intersection of Pueyrredon Avenue and Tucuman Street is the greatest concentration of kosher restaurants and shops in the city. No one building can sum up the cultural dissonance of Buenos Aires better than the seat of the archbishop—Pope Francis’ former office—the Catedral Metropolitana. Situated on Plaza de Mayo, the massive pile built out of a hodgepodge of architectural designs has existed in one form or another since colonial times. Inside, look for the mausoleum of General José de San Martin. The cathedral is unique for hosting what may be the only Holocaust memorial found in a church. Inaugurated in 1997, the memorial is made up of a clear panel of glass, protecting pages from Jewish prayer books, Hebrew Bibles and Talmuds saved from Treblinka and Auschwitz, the Warsaw Ghetto and the AMIA community center as well as the Israeli Embassy to Argentina. The glass panel is held together by a silver frame whose corners bear a tree of life, menorah, Ten Commandments and Star of David. Getting around the metropolis is easy and cheap by taking the Subte—Buenos Aires’ subway system. Most stations have unique artwork decorating the platforms. Traveling from downtown to the Jewish barrio of Once, it’s worth getting off at the Pasteur-AMIA station. Though the community center was rebuilt after the bombing, the station was recently decorated in honor of the victims. On the walls lining the platform are the names of the victims, along with murals featuring cartoons and paintings criticizing the gov-ernment’s failure to bring those responsible to justice. Be sure to reread Dante Alighieri’s The Divine Comedy before visiting Buenos Aires. Once the tallest skyscraper in Latin America, the Palacio Barolo was built in the 1920s, and its eclectic design was inspired by Dante’s trilogy about hell, purgatory and heaven. The Art Deco structure is capped by a lighthouse. To reach the heavenly light, however, visitors must change elevators on the 14th floor—purgatory—before ascending to the top. The building has a twin 125 miles away in Montevideo, the capital of Uruguay, and the two lighthouses’ beams were meant to intersect over the Rio de la Plata; the architect failed to account for the curvature of the earth, however, so the beams never cross. 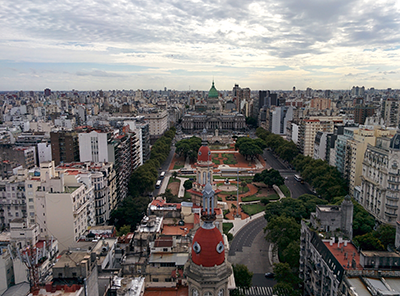 From the 22nd floor, one has an unparalleled view of the city, with the National Congress building and its verdant plaza stretching below to the west, and the Casa Rosada—the presidential palace—to the east. During the nighttime tour, guides will turn on the lighthouse and point out other city landmarks. Spend Sunday morning or afternoon perusing the arts and crafts of the San Telmo street market. Defensa transforms from an ordinary one-way street in a working class neighborhood into a vibrant pedestrian thoroughfare with live music, performers, food and drink. Most of the items on sale are touristy knickknacks and novelty gifts. But there’s an antiques market at Plaza Dorrego, at the southern end of the street, where a discerning eye can find deals on jewelry and art. Facing the square is an eponymous old-time café that’s been in business since the 1870s and was frequented by Buenos Aires intellectual giants such as Jorge Luis Borges. Be sure to take a break and try the homemade ice cream (artisanal ice cream is popular throughout Argentina). The Palermo neighborhood is the largest barrio in the capital in terms of area, population and things worth seeing. It’s the culinary hotspot of the city, with more bars, cafés and restaurants than most other locales. Palermo Soho, named because of its profusion of fashion designers, is a must for clothing and accessories. For an extravagant night out, try Henderson’s, a Prohibition-style speakeasy hidden in the back of Nicky’s New York Sushi. Just ask for the wine cellar. Much of Palermo is dominated by the city’s green lungs, stretches of gardens running along its north end. The Botanical Gardens, located on Santa Fe Avenue, showcase indigenous and foreign flora and provide a shady retreat from the blazing summer sun. The centerpiece of the Palermo parkland is the Rosedal: a massive manicured rose garden featuring an astonishing 15,000 rosebushes and 1,189 different varietals. Ilan Ben Zion is a reporter based in Jerusalem who writes about antiquities, food and travel. In addition to the Jewish museum at Templo Libertad (4 1/2 years ago), we also visited the Anne Frank Center….further, we spent a significant amount of time visiting Recoleta Cemetery (be sure to also visit the interior of the adjacent church, as it’s gorgeous) – and, we visited another beautiful cemetery (Chacarita). The San Telmo Market was fun and we really liked the Palermo neighborhood (and we were able to find restaurants serving vegetarian food there). Lastly, we visited a bookstore (El Ateneo) which has a *gorgeous* interior and also a superb selection of books (admittedly I speak Spanish well, but my primary interest was photography and art books).